With our experienced team of installers we can meet any requirements. From installing vinyl cut graphics to wrapping whole buildings in print, we can do it! 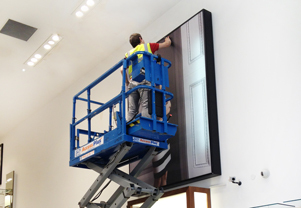 We have graphic installers, carpenters & electricians available 24/7 and EU-wide. No job is too big or small. For a no-obligation quote please call our large format team on 020 7874 1900 or send a quote request from here.